She’s a boss mama who makes a living from home editing court reporters’ transcripts. Tiffany, are you making up words?! I know; I know. “Scopist” isn’t a word you’ll find in the Merriam-Webster dictionary, but I promise you it’s a thing. In fact, it’s a pretty darn legitimate thing/career, and it’s one not many people have heard of! 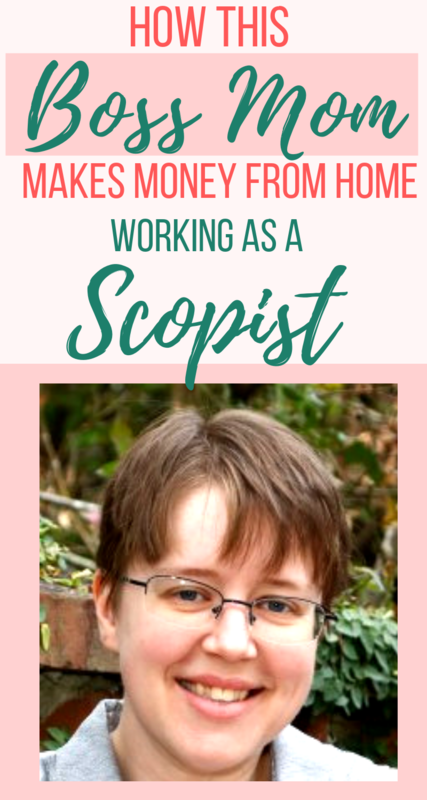 Now, I personally work in this industry as a proofreader, but scoping is such a cool gig, I had to find someone to interview to share with you all a little bit about it and why it may be an amazing career opportunity for you. Luckily, my colleague Darcy has agreed to clue us in on her experience working as a scopist! Proofreading is another fantastic career option for many word nerds, and many folks, such as Darcy, have made both scoping and proofreading their work-from-home career. (Check out my posts on proofreading here and here.) Darcy took an online course called Internet Scoping School to learn how to scope before launching the scoping side of her business. So without further ado, let’s get into the interview! Tiffany: Hi, Darcy! Tell us a bit about yourself. Darcy: I was born and raised in Maryland, the eldest of four (three girls, one boy). I married my husband in January of 2015, and we have a daughter who was born four days before our second anniversary. Aside from my work, I enjoy knitting, tabletop role-playing games, and reading sci-fi/fantasy novels. Despite not finishing my graduate studies, I actually do enjoy linguistics too, and I am getting into the hobby of conlanging, or creating constructed languages. My husband has had two cats since before we met, and I love them, but I can't say that I'll want to get more pets when they're gone; I just don't have the patience and energy for them, on top of caring for a toddler and all of the other things I do or beings I interact with in a given day. Tiffany: Very cool! I know the struggle with pets—so loveable, but they do require work and lots of attention. Anyway, what did you do before you got into scoping? Darcy: That's a bit of a long story. When my husband and I first got married in 2015, I was working for TSA up in the DC metro area. My husband got a job down in South Carolina, and I did not want to give up the vacation time I had saved in order to go to GenCon that year and use it to pack up, move, and unpack--plus, we were planning on starting a family soon--so I quit that job instead of transferring to another airport near here. I had planned to go to graduate school--to this day, I still don't know why. I guess it just seemed like the "next step." None of my career aspirations (not that I had any at the time) required a master's degree in anything, much less historical linguistics. But anyway, I found a list of legitimate work-from-home jobs online, and one of those was proofreading for court reporters. I took an online course while I was pregnant, finished it before I gave birth, and had my first client by the time my daughter was 3 months old. I started grad school a few months after that. I was originally hoping that proofreading would pay for graduate school, but I ended up liking it a whole lot more than I thought--and there wasn't enough time while my daughter was asleep to do both work and school stuff--so I withdrew from school in February of 2019, about halfway to the end of my master's program. Tiffany: How did you hear about scoping and what made you decide to take the leap? Darcy: I began with proofreading, and I joined a Facebook group for proofreaders of court reporters' transcripts. I heard about scoping from that group, and it sounded like such a fun job that I just had to add it to my repertoire. Tiffany: That’s awesome! The more skills you add, the more possibilities open up and more money you can make. :) What did you find most valuable about Internet Scoping School? Darcy: I found the notereading section the most valuable. Besides the software, it was the one part of the scoping aspects of court reporting (punctuation, transcript "anatomy," etc) that I had the least knowledge about already, since I had already been proofreading. I have never had trouble picking up new software packages and running with them, so learning that was a breeze compared to the notereading. Tiffany: Nice! I’d definitely say that an ability to pick things up and an eagerness to learn is SO important in this industry, and being at least a bit tech-savvy like you are certainly doesn’t hurt either! How long did it take you to get your first client? Darcy: I already had some "ready-made" clients in some proofreading clients of mine, or rather some reporters who worked with the same agency as my longest-running regular client, so maybe a week. Tiffany: A week! That is amazing. It’s certainly not difficult to find work in this industry once you get going, and having clients ready to go when you started scoping must have been awesome. So what’s your favorite thing about scoping? Darcy: Sometimes, the attorney arguments or snarky witness responses are hilarious. Those are the bits that keep me going through long slogs of boring depositions. Tiffany: Haha! I know exactly what you mean. It’s always entertaining to find some humor or sass amidst the drudgery! ;) But what’s your least favorite thing about scoping? Darcy: Sometimes, I have to read boring depositions about--for instance--carburetors, or topics that, for the mother of a two-year-old little girl like me, are challenging, such as child death or molestation. Tiffany: That’s tough. There certainly are some boring and difficult cases in our legal system. What character traits do you think are essential to working as a scopist? You have to be self-motivated; the clients won't just come to you. You have to look for them, seek them out. You also have at least passable time management skills, and you need to be detail oriented. If you can't see the details in what you're reading, you're going to miss a lot, and if you don't know how long it will take you to scope a certain number of pages (on average) then you're going to end up missing deadlines too. Tiffany: Absolutely. Attention to detail is key, and so is an ability to self-motivate and stick to deadlines. What advice would you give to someone considering making scoping their career? Darcy: If you're a native English speaker, good at punctuation and spelling, able to figure out the "weird" things people say from phonetic clues, and are willing to put the time in to learn how to do it right, scoping can be a rewarding career. Tiffany: I completely agree! There’s something so cool about being a part of making sure court reporters’ transcripts are accurate and polished. Transcripts are a vital part of our court system, and scopists (as well as proofreaders) work behind the scenes to make sure the final product is as clean and accurate as possible. On another note, does having a little one at home and working as a scopist work well for you? And is scoping a career you'd recommend to stay-at-home moms looking for a way to make money from home? Darcy: It works a lot better now than it did when I was trying to juggle grad school too. My daughter is in daycare four days a week—the facility is on the university campus where my husband teaches political science—and I am able to fit in up to about 35 or 40 hours of work over a week's time (when I have work to do). It's just not Monday through Friday 8:00 to 5:00 or anything like that. It's more like Tuesday through Friday 9:00 a.m. to 4:00 or 4:30 p.m. and 7:30 to 10:00 p.m., and Saturday through Monday 12:00 to 2:00 p.m. and 7:30 to 10:00 p.m. Basically, when my daughter's either at daycare or sleeping (and I'm not). I would totally recommend scoping or proofreading to stay-at-home moms looking for a way to make money from home. At the very least, it's a great part-time gig, and it pays either comparably to or better than a job you'd have to leave the house to do, depending on the job. I also do my scoping on a laptop and my proofreading on a tablet (or my laptop, if I want), so I could just pack it all up and take it to a park, work there. I'm not tied to the same boring scenery every day if I don't want to be. Oh my gosh, juggling a career and grad school would be SO much work. That’s great that you’re now able to schedule your work around your life, and you can take it where you want! Any final thoughts? Darcy: There is a shortage of court reporters out there, especially those who use stenography. As a result, the ones who are out there are looking for scopists—who are still in pretty short supply as well—to take up some of the slack so that they can get back out and take jobs more often. Do not worry that scoping is a dying profession; we will be needed as long as there are court reporters who need more time. Also, don't be afraid to say no once you've got a client base. If you can't handle any one job, tell your client that and offer to give him or her a list of scopists who are able and willing to take it on. You'll foster client loyalty by being honest, and they'll still be able to send jobs to you when you are available, as well as to a backup (or two, or three) if you're not. Tiffany: Fantastic advice, Darcy. The beautiful thing about being your own boss is you can say no to work if you want or need to. And you mentioned client loyalty, which is also one of my favorite things about this industry. There’s a sense of camaraderie you build with clients when you work on jobs together, and the relationships you cultivate with court reporters can be so rewarding! Many thanks to the lovely Darcy for taking the time for this interview! Be sure to check out her website at www.thornburgproofreading.com. Are you interested in learning how to scope? If so, I highly recommend you check out Internet Scoping School to learn the tools you’ll need to launch a successful work-from-home business as a scopist.